Norwich has everything. Thus, the normally dry and undemonstrative Nikolaus Pevsner began his survey of the capital of Norfolk in his 1962 volume Buildings of England: Norwich and north-east Norfolk. And there is no doubt that this is one of the best cities of its size in northern Europe. Living in Ipswich as I do, I hear plenty of grumbles about Norwich; but really, although the two places have roughly the same population, Ipswich cannot even begin to compare with regard to its townscape. The only features which the capital of Suffolk can claim to hold above its beautiful northern neighbour are a large central park (Norwich's Chapelfield gardens is not a patch on Ipswich's Christchurch Park) and a large body of water in the heart of the town, perhaps Ipswich's most endearing feature and greatest saving grace. I think it would be possible to visit Norwich and not even know this cathedral was there. The centre of the city is dominated by the castle, and the most familiar feature to visitors is the great market square widened by the clearances of the 1930s, and the fine City Hall built at that time which towers above it. In comparison, Norwich Cathedral sits down in a dip beside the river, walled in by its close, and is visible best from outside the city walls, especially from the east on the riverside, and to the north from Mousehold Heath. If you arrive by road from the south or west, you may not even catch a glimpse of it. The great spire is hidden by those winding streets and alleys, and many of the city's churches are more visible, especially St Giles, St Peter Mancroft in the Market Place, and the vast Catholic Cathedral of St John the Baptist, on Grapes Hill. It is said that the nave floor of St John the Baptist is at the same height above sea level as the top of the crossing of the Anglican cathedral. With the possible exception of Lincoln Cathedral, I think that Norwich Cathedral is my favourite cathedral in all England. Call this East of England chauvinism if you like, But Norwich Cathedral has everything you could possible want from a great medieval building. But there is more to it than that. It is also one of the most welcoming cathedrals in England. There is no charge for admission, and they positively encourage you to wander around through the daily business of the cathedral, in the continental manner. No boards saying Silence Please - Service in Progress here. Because of this, the Cathedral becomes an act of witness in itself, and you step into what feels like it probably really is the house of God on Earth. They even used to say the Lord's Prayer over the PA system once an hour, and invite you to stop and join in - I wish they'd go back to doing that. The three pounds you pay for a photography permit must be one of the bargains of the century so far. Norwich Cathedral is unusual, in that this is the original building. It has been augmented over the centuries of course, but this is still essentially the very first cathedral on this site. This is because the see was only moved to Norwich after the Norman invasion. The Normans saw the wisdom of drawing together ecclesiastical and civil power, and one way in which this might be achieved was by siting the cathedrals in the hearts of important towns. At the time of the conquest, Bishop Herfast had his seat at Thetford, and it was decided to move the see to Bury St Edmunds in Suffolk. It had moved several times during the previous four centuries, from Walton in Suffolk to North Elmham in Norfolk before Thetford, where the first proper but simple stone building had been raised. But as well as an eye for efficient administration, the Normans brought the idea that Cathedrals should be glorified; already, vast edifices were being raised in Durham, London and Ely. and Bury St Edmunds, with its famous Abbey, was the obvious place for the Diocese of East Anglia to sit. However, such a move would have removed the Abbey's independent direct line with Rome, and placed it under the jurisdiction of the Province of Canterbury. The Abbey community was determined that this would not happen, and Abbot Baldwin sent representations to the Pope that ensured the survival of St Edmundsbury Abbey's independence. Bishop Herfast would not be allowed to glorify his position in East Anglia in the way his colleagues were doing elsewhere. But his successor, Herbert de Losinga, was more determined - and, perhaps, steeled by his conscience. A Norman, he had bought the Bishopric from the King in 1091, an act of simony that required penance. Building a great cathedral could be seen as that act of penance. But where? Bury was a lost cause; instead, he chose to move the see to a thriving market town in the north-east of his Diocese; a smaller, more remote place than Bury, to be sure, but proximity to the Abbey of St Edmund was perhaps not such a good thing anyway. It tended to cast a rather heavy shadow. And so it was that the great medieval cathedral of the East Anglian bishops came to be built, instead, at Norwich. Work began in 1094, and seems to have been complete by 1145. It is one of the great Romanesque buildings of northern Europe, its special character a result of responses to fires and collapses over the course of the next few centuries. At the Reformation in the sixteenth century, it became a protestant cathedral of the new Church of England, losing its role as a setting for ancient sacraments and devotions, but being maintained as the administrative seat of a Diocese which covered all of Norfolk and Suffolk, and the ceremonial church of its great city. 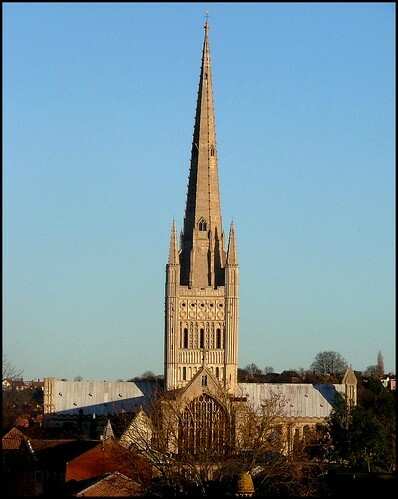 In the 19th Century, the western part of the Norwich Diocese was transferred into that of Ely, and at the start of the 20th Century the southern parishes became part of the new Diocese of St Edmundsbury and Ipswich. Today, the Diocese of Norwich consists of north, south and east Norfolk, and the north-eastern tip of Suffolk. The perfection of Norwich is of distant views, the cloisters, and the interior. The exterior is hemmed in, and the most familiar part of the building, the west front, is a poor thing, the victim of barbarous restorations in the 18th and 19th centuries. It is almost a surprise to step through its mundanity into the soaring glory of the nave. Above, the famous vaulting is home to one of the largest collections of medieval bosses in the world. There are more in the beautiful cloisters. The view to the east is of the great organ, looking very 17th Century but actually the work of Stephen Dykes Bower in the 1950s. Beyond is the intimacy of the quire and ambulatory with its radial chapels, the best of which is St Luke's chapel, containing the Despenser retable. Bishop Despenser is one of history's villains, putting down the Peasants Revolt in East Anglia with some enthusiasm. It is likely that this retable was made for the cathedral's high altar, possibly even to give thanks for the end of the Revolt. It was discovered upside down in use as a table in the 1840s. This chapel is, unusually, also a parish church; the parish of St Mary in the Marsh, the church of which was demolished at the Reformation, moved into the cathedral. They brought their seven sacrament font with them, and here it remains. In the ambulatory there are many traces of medieval paint, almost certainly from the original building of the Cathedral. Two curiosities: at the back of the apse is the original Bishop's chair, and rising across the north side of the ambulatory like a bridge is a relic screen. There is a good range of glass dating from the 14th to the 21st centuries. Highlights include the medieval panels in the north side of the ambulatory, Edward Burne-Jones's bold figures in the north transept, Moira Forsyth's spectacular Benedictine window of 1964 in a south chapel, and the millennium glass high in the north transept, which I think will in time become one of the defining features of the Cathedral. The figure of the Blessed Virgin with the Christ Child seated on her lap is the work of Norfolk-based artist John Hayward, who died recently, but the glass above is Hayward's reworking of Keith New's 1960s glass for St Stephen Walbrook in London, removed from there in the 1980s, and now reset here. Towards the west end of the nave are two sets of Stuart royal arms in glass, a rare survival. I grew up in a city some sixty miles away from Norwich, but I didn't come here until I was in my mid-teens. I remember wandering around this building and being blown away by it, and I still get that feeling today. There is always something new to find here. My favourite time here is first thing in the morning on a winter Saturday. Often, I can be the only visitor, which only increases the awe. Another time I like to be here in winter is on a Saturday afternoon for choral evensong. Perhaps best of all, though, is to wander and wonder in the cloisters on a bright sunny day, gazing at fabulous bosses almost within arm's reach. Several English cathedrals have good closes, but Norwich's is the only one in a major city, I think. It creates the sense of an ecclesiastical village at the heart of the city; and then, beyond, the lanes and alleys spread out, still hanging on despite German bombing and asinine redevelopment. And now I think perhaps it is part of the beauty of this building that it is tucked away by the river, a place to seek out and explore. Norwich has everything, says Pevsner. But really, I think this is the very best thing of all. Because there are so many images for this entry, I have divided them into three separate pages. Click on the link below for the page you want. You can then come back to this page to visit the other pages.